This section measures your ability to understand academic passages in English. The Reading section is divided into 2 separately timed parts. Most questions are worth 1 point but the last question in each set is worth more than 1 point. The directions indicate how many points you may receive. There are three passages on the short format and five passages on the long for- mat. After each passage, you will answer 12-14 questions about it. You may now begin the Reading section. Radiocarbon dating is a scientific method used for determining the approximate ages of organic archaeological samples. Although there are several other techniques employed s to estimate the ages of ancient remains, carbon-14 (also known as 14C) is the most commonly used. The radiocarbon dating method measures the amount of 14C in organic material in order to ascertain how much time has passed since an organism’s death. This method has been employed to determine the ages of subjects that lived as long as fifty thousand years ago. Although radiocarbon dating cannot directly calculate the ages of inorganic materials, such as coins, organic matter discovered on the same ground level, or stratum, can provide an accurate estimate based on the presumption that both objects once coexisted. Because of its broad applications, radiocarbon dating is utilized in various fields, such as archaeology, anthropology, and geology. Prior to the advent of radiocarbon dating, researchers studying ancient artifacts 25 were able to conclude that when objects were uncovered at archaeological sites, the deeper they were found in the ground, the older they were. Scientists also deduced that remnants discovered on a similar stratum were most 30 likely comparable in age. There were, however, some obstacles to this method of dating artifacts. Accurately determining the age of a sample required confirmation from written records, and if no such records existed—due to is the age of the item, for example—verifying the time frame was virtually impossible. Moreover, samples found at similar ground depths but at great distances apart could not automatically be assumed to be equivalent without other supporting evidence. Fortunately, the radiocarbon dating technique, developed in 1949 by Willard F. Libby, helped to resolve these problems. When 14C, which is naturally present in very small quantities in the air, is absorbed by living organisms, some of it remains in their tissues. 14C is created in the upper atmosphere where it unites with oxygen and transforms into carbon dioxide (CO2). In this form, it is integrated into the Earth’s ecology, as plants absorb carbon dioxide from the air and pass along the 14C to organisms higher up in the food chain; animals devour plants, taking in 14C, and humans in turn consume 5 both. Throughout an organism’s life cycle, it constantly takes in 14C. [A] When living things die, however, 14C stops being absorbed, and the amount inside the dead organism begins to decay. [B] Libby found that by measuring the 0 amount of 14C that was left in organic material, the age of the subject could be estimated, as the rate of decay, or half-life of 14C, is gradual yet steady. [C] Various radioactive substances have different rates of decay, ranging from <5 seconds to thousands of years. [D] In the case of 14C , it takes 5,730 years for half of the initial quantity of the 14C that was absorbed by an organism to disappear after it has died. It takes another 5,730 years for half of the remaining half to decay, and so on. This means if Libby discovered that 14C from an organic sample gave off half as much radiation as modem 14C, he could estimate the sample to be approximately 5,730 years old. There are limits to this procedure, however—namely, that it can only estimate the ages of organic objects that are less than fifty thousand years old. In objects older than that, the quantity of 14C is too small for scientists to examine and render a reliable conclusion. But, overall, the technique is still highly dependable. To demonstrate its effectiveness, the radiocarbon dating method has been tested on historically recorded artifacts whose ages are known, such as the Dead Sea Scrolls and pieces of an Egyptian tomb; the results have been very impressive—the ages calculated by the radiocarbon dating technique closely match the ages of the artifacts as -o documented in historical records. These tests have proven that radiocarbon dating is an invaluable tool, one which will undoubtedly continue to be used in the future for a variety of applications. (A) Coins are an example of inorganic matter commonly found on a stratum. (B) Radiocarbon dating cannot provide information about the age of organic matter. (C) It is possible to estimate the age of inorganic matter that is found on the same stratum as objects they coexisted with. (D) Some objects cannot be radiocarbon- dated, but their ages likely match those of objects on the same stratum. 7. According to paragraph 3, how did scientists determine the ages of archaeological samples before radiocarbon dating? (A) They referred to historical records. (B) They compared items from different strata. (C) They contrasted items found in different areas. (D) They measured the amount of oxygen in items. 8. According to paragraph 4, how did Libby’s technique benefit the field of archaeology? (A) It used 14C to identify archaeological samples buried underground. (B) It found small quantities of 14C in the air. (C) It naturally absorbed 14C from archaeological samples. (D) It used 14C to estimate the ages of archaeological samples. 9. What can be inferred from paragraph 4 about the rates of decay of some radioactive substances? (A) They are too fast to be useful for dating purposes. (B) They do not have half-lives. (C) They are more consistent than 14C. (D) They are too difficult to calculate. 11. Why does the author mention the Dead Sea Scrolls in paragraph 5? 12. Look at the four squares m that indicate where the following sentence could be added to the passage. This slow rate of decay makes 14C ideal for use in determining the ages of ancient artifacts. 13. Directions: An introductory sentence for a brief summary of the passage is provided below. Complete the summary by selecting the THREE answer choices that express the most important ideas in the passage. Some sentences do not belong in the summary because they express ideas that are not presented in the passage or are minor ideas in the passage. This question is worth 2 points. The radiocarbon dating method is a procedure that measures the amount of 14C in organic remains and uses that information to accurately estimate the ages of old artifacts. (A) Because 14C is present in the atmosphere, it is constantly absorbed by living things and can be found in every organism. (C) Comparing an artifact with historical records is a useful way of determining its origin and age, but it is not always accurate. (E) Scientists have verified the preciseness of the radiocarbon dating method by testing it on artifacts whose ages are known. (B) UC, which is formed in the upper atmosphere, is a component of air all over the Earth. (D) Although radiocarbon dating is limited to artifacts less than fifty thousand years old, it is a dependable and invaluable tool. (F) Radiocarbon dating is useful in fields other than archaeology, such as anthropology and geology. Hello. Thanks for sharing the materials. Can you please check the answers? Hi, you got 35/40. Great job! Keep up the good work! Please check below for your wrong answers. Wiki TOEFL, I have practice form TEST 1 to 5, three days ago and now want to check my all of the answers tomorrow, as I have to manage time for that. So it would be great if you send me all of the answers from 1 to 5. I would apply strategies for next 6 to 10 sets after checking my mistakes. A lot of thanks to wiki toefl. I just have sent email to you. Please take a check! Could you send me the answers please? Hi Prernna. I will update Solution & Explanation for TOEFL Reading Practice Test Daily from test 01 to test 75. Now is Reading Practice Test 5. Please wait and follow my webiste to receive the Latest Reading Solution. Hi Sunah. 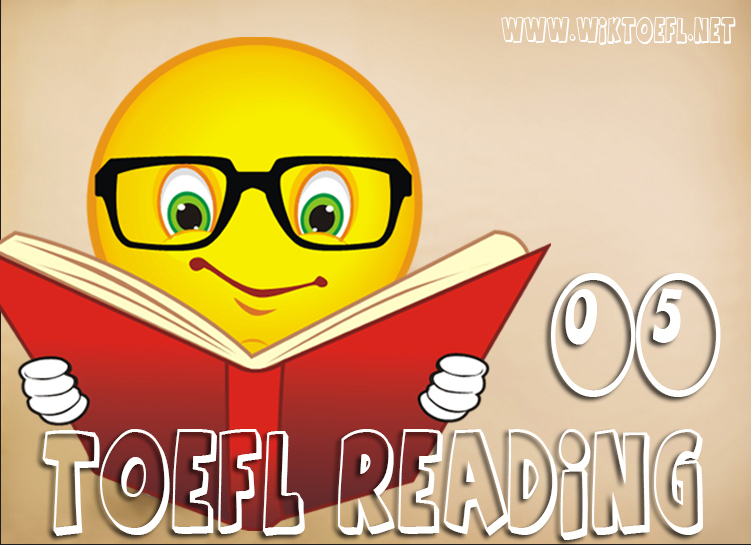 I will update Solution & Explanation for TOEFL Reading Practice Test Daily from test 01 to test 75. Now is Reading Practice Test 2. Please wait and follow my webiste to receive the Latest Reading Solution.